An online archive offering digital copies of many peer-reviewed articles published by Elizabeth Shown Mills on Cane River and other historical subjects. Written by Washington Post Staff Writer Ken Ringle and run on Sunday, May 12, 2002, this article offers great historical background on the story behind the Isle of Canes. The mission of the Louisiana Creole Heritage Center is to promote, foster and engage in activities and endeavors that relate to Louisiana Creoles and their culture. Hosted by the Watson Memorial Library, Northwestern State University of Louisiana— Here you'll find Louisiana books, rare books, archival materials, The NSU Archives, microfilm, maps, newspapers, and oral history tapes. The collection includes many items of interest pertaining to Creole culture and history. A photography site maintained by a local photographer and includes many contemporary images of Natchitoches. This is the Natchitoches Parish Tourist Commission Internet site. 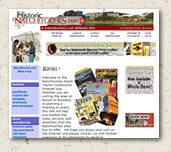 This site is valuable for learning about travel and tourism in the Natchitoches area. Lennon, Rachal Mills and Elizabeth Shown Mills. “Mother, Thy Name is Mystery! Finding the Slave who Bore Philomene Daurat.” Reassembling Female Lives, a special issue of the National Genealogical Society Quarterly 88 (September 2000): 201–28. NOTE: This article details the research process that uncovered the slave ancestry presented in Lalita Tademy’s Cane River. Tademy’s forebears lived on the plantation of Louis Derbanne, who appears in Isle of Canes as a friend and neighbor of Augustin Metoyer. Mills, Elizabeth Shown. “Deliberate Fraud and Mangled Evidence: The Search for the Fictional Family of Anne Marie Philippe of Natchitoches, Louisiana.” The American Genealogist 72 (July–October 1997): 353–68. Available from www.americangenealogist.com. NOTE: This article traces the German ancestry of Agnes Poissot, the slave-born bride of Augustin Metoyer. As “the old lieutenant’s wife” and Agnes’s grandmother, Anne Marie Philippe earns a mention on p. 250 of Isle of Canes. -------. “(de) Mézières-Trichel-Grappe: A Study of a Tri-caste Lineage in the Old South.” The Genealogist, ser. 1, vol. 6 (Spring 1985): 4–84. Available from the publisher of series 1, gryphon801@aol.com. NOTE: This article traces both the ancestry and the mixed-race offspring of the French nobleman and Natchitoches commandant, Athanase Mauguet de Mézières, who appears throughout the early chapters of Isle of Canes. -------.“Forgotten People of America.” Ancestry Magazine (May–June 2004): 16–22. NOTE: Here, the author of Isle of Canes discusses the magnet that drew her to the Isle and some of the intriguing challenges she faced as she and her late husband uncovered the roots of the story. ———. “Quintanilla’s Crusade, 1775–1783: ‘Moral Reform’ and Its Consequences on the Natchitoches Frontier.” Louisiana History 42 (Summer 2001): 277–302. NOTE: The Capuchin padré Luis de Quintanilla plays a strong role in Part 2, Isle of Canes. This article provides additional historical perspective on his moral crusade and upon early miscegenation along Cane River. ———. “Social and Family Patterns on the Colonial Louisiana Frontier.” Sociological Spectrum 2 (July–December 1982): 233–48. NOTE: This paper examines community lifestyles during the first century of Cane River’s settlement. Mills, Elizabeth Shown and Gary B. Mills. “Louise Marguerite: St. Denis’ Other Daughter.” Southern Studies 16 (Fall 1977): 321–28. NOTE: Here, the Millses presents the research by which they discovered that Commandant Louis Juchereau de St. Denis fathered a Native American daughter by a member of the Natchitoches tribe. That daughter, Louise Marguerite de St. Denis (Mme. Pierre-Louis Duplessis) makes a cameo appearance on pp. 43–44 of Isle of Canes and is discussed elsewhere in Parts One and Two. ———. “Marie Thérèse and the Founding of Melrose: A Study of Facts and Fallacies.” Natchitoches Times, 29 July; 5, 12, and 19 August 1973. NOTE: This serialized report concludes the historical site documentation project commissioned by the Association for the Preservation of Historic Natchitoches, upon which Melrose Plantation was declared a National Historic Landmark. ———. “Missionaries Compromised: Early Evangelization of Slaves and Free People of Color in North Louisiana.” Cross, Crozier, and Crucible, Glenn R. Conrad. ed. New Orleans: Archdiocese of New Orleans, 1993. Pages 30–47. Available from http://archdiocese-no.org/archives/page5.htm. NOTE: This essay compares Catholicity on the Isle to other Creole populations along Cane River. ———. “Slaves and Masters: The Louisiana Metoyers.” National Genealogical Society Quarterly 70 (September 1982): 164–89. NOTE: Here, the authors provide genealogical documentation for the first three generations of Coincoin’s family, from her parents through her grandchildren. Mills, Gary B. “A Portrait of Achievement: Nicolas Augustin Metoyer, f.m.c.” Red River Valley Historical Review 2 (Fall 1975): 332–48. NOTE: A biography, as the title implies. ———. “Coincoin: An Eighteenth-Century ‘Liberated’ Woman.” Journal of Southern History 42 (May 1976): 203–22. Reprinted in Darlene Clark Hine, ed., Black Women in United States History. Brooklyn: Carlson Publishing, 1990. ———. “Monet-Rachal: Backtracking a Cross-Racial Heritage in the Eighteenth and Nineteenth Centuries.” The American Genealogist 65 (July 1990): 129–42. Available from the publisher at www.americangenealogist.com. NOTE: This paper explores a passé blanc Cane River family, identifying its slave roots and demonstrating how it crossed the color line by marrying “Anglo” newcomers to the region. ———. “Liberté, Fraternité, and Everything but Egalité: Cane River’s Citoyens de Couleur.” North Louisiana to 1865: Essays on the Region and Its History. Ruston, La. : McGinty Trust Fund Publications, Louisiana Tech University, 1984. Pages 93–112. NOTE: This essay explores the failed efforts of the Isle families to earn citizenship in the “Anglo” regime of antebellum Louisiana. ———. “Patriotism Frustrated: The ‘Native Guards’ of Confederate Natchitoches.” Louisiana History 18 (Fall 1977): 437–41. NOTE: Here, Mills presents a study of the Augustin’s Guards and Monette’s Rifles, the two home-guard units raised on the Isle to protect Cane River during the Civil War. The two ill-fated units appear in Part 5 of Isle of Canes. ———. “Piety and Prejudice: A Colored Catholic Community in the Antebellum South.” Catholics in the Old South: Essays on Church and Culture, Jon L. Wakelyn and Randall M. Miller, eds. Macon, Ga.: Mercer University Press, 1983. Pages 171–94. Available from www.mupress.org. NOTE: This essay explores the Isle’s futile attempts to earn equality through religious leadership. Saxon, Lyle. Children of Strangers. Boston: Houghton Mifflin, 1937. NOTE: Saxon, who frequently visited Melrose Plantation in the 1920s–1940s, presents his interpretation of the Isle’s plight in the early twentieth century. Tademy, Lalita. Cane River. New York: Warner Books, 2001. NOTE: Tademy, an offspring of Cane River, presents her family’s experiences with slavery and Jim Crow racism from the 1830s to the 1930s. Louis Derbanne, the French-Indian Cane River planter who owned Tademy’s earliest-known forebears, appears in Isle of Canes as a neighbor of Augustin Metoyer. Callahan, J. J., et al. The History of St. Augustine’s Parish: Isle Brevelle, Natchez, La. : 1803–1953; 1829–1954; 1856–1956. Natchitoches: The Parish, 1956. NOTE: Callahan’s little pamphlet primarily presents local tradition. Mills, Elizabeth Shown and Gary B. Mills. Tales of Old Natchitoches. Natchitoches: Association for the Preservation of Historic Natchitoches, 1978. Available from www.willowbendbooks.com. NOTE: This collection of historical vignettes, which the authors developed from archival research rather than lore, originated as a series published in the Natchitoches Times during America’s Bicentennial celebration. Mills, Elizabeth Shown and Gary B. Mills. Melrose. Natchitoches: Association for the Preservation of Historic Natchitoches, 1973. NOTE: This small book summarizes, for Melrose tourists, the story of Coincoin and her offspring. Mills, Gary B. The Forgotten People: Cane River’s Creoles of Color. Baton Rouge: Louisiana State University Press, 1976. Available from www.lsu.edu/lsupress/. NOTE: In this groundbreaking study that focuses principally upon the Metoyers, Mills presents the first in-depth social and economic history of a mixed-race family. Phares, Ross. Cavalier in the Wilderness. New Orleans: Pelican Books, 1976. NOTE: A romanticized biography of Louis Juchereau de St. Denis, the frontier commandant who owned Coincoin and her parents. Woods, Frances Jerome (Sister). Marginality and Identity: A Colored Creole Family through Ten Generations. Baton Rouge: Louisiana State University Press, 1972. Available from www.lsu.edu/lsupress/. Bearss, E. C., ed. A Louisiana Confederate: Diary of Felix Pierre Poché. Natchitoches: Northwestern State University, 1972. NOTE: Lieutenant Poché, whose diary covers the period of his military service on Cane River, makes a cameo appearance on pp. 517–19 of Isle of Canes. Bolton, Herbert Eugene, trans. and ed. Athanase De Mézières and the Louisiana-Texas Frontier, 1768–1780. 2 vols. Cleveland: Arthur H. Clark Co., 1914. NOTE: This classic work presents a rich trove of colonial records created by the Natchitoches commandant who befriended Coincoin and her French lover, Pierre Metoyer. The genealogical background added by Bolton is less than accurate. For the latest research, see Elizabeth Shown Mills, “(de) Mézières-Trichel-Grappe,” cited under “Articles and Book Chapters” above. McCants, Dorothea Olga (Sister), ed. and trans. They Came to Louisiana: Letters of a Catholic Mission, 1854–1882. Baton Rouge: Louisiana State University Press, 1970. Available from www.lsu.edu/lsupress/. NOTE: The Daughters of the Cross, whose Louisiana writings are assembled in this volume, was the order that established St. Joseph’s Convent for the young ladies of the Isle in 1857. Mills, Elizabeth Shown. Natchitoches: Abstracts of the Catholic Church Registers of the French and Spanish Post of St. Jean Baptiste des Natchitoches in Louisiana, 1729–1803. New Orleans: Polyanthos, 1976. Available from www.willowbendbooks.com. NOTE: This volume, and the two that follow, provide indexed and translated abstracts of almost all Catholic baptisms, marriages, and burials for Cane River prior to 1850—including records for slaves and free people of color, as well as the dominant white population. ———. Natchitoches, 1800–1826: Translated Abstracts of Register Number Five of the Catholic Church Parish of St. François des Natchitoches in Louisiana. 1980; reprint Bowie, Md. : Willow Bend Books, 2004. Available from www.willowbendbooks.com. ———. Natchitoches Church Marriages, 1818–1850: Translated Abstracts from the Registers of St. François des Natchitoches, Louisiana. 1985; reprint Bowie, Md. : Willow Bend Books, 2004. Available from www.willowbendbooks.com. ———. Natchitoches Colonials: Censuses, Military Rolls and Tax Lists, 1722–1803. Chicago: Adams Press, 1981. Currently out of print. NOTE: This volume presents most of the colonial censuses and census substitutes needed for genealogical and historical research. Crespi, Muriel. “A Brief Ethnography of Magnolia Plantation: Planning for Cane River Creole National Historical Park.” Studies in Archeology and Ethnography, no. 4. National Park Service Service. www.cr.nps.gov/aad/pubs/studies/study04a.htm. NOTE: Magnolia Plantation, at the foot of the Isle, belonged to the Hertzogs who play a cameo role in Isle of Canes. It is Cane River’s most intact slave plantation and a focal point of the Cane River Creole National Historical Park. Crespi interviewed descendants of many slave and free Creole families in the region and relates those accounts. Gould, Philip, Richard Seale, Harlan Mark Guidry, and Robert B. DeBlieux. Natchitoches and Louisiana’s Timeless Cane River. Baton Rouge: Louisiana State University Press, 2002. Available from www.lsu.edu/lsupress/. NOTE: Gould’s dramatic photographs and the vivid word-pictures of Seale, Guidry, and DeBlieux make for a mesmerizing photographic history. Lee, Dayna Bowker. “Indian Slavery in Lower Louisiana during the Colonial Period, 1699–1803.” Bound typescript, c1989. 116 pp. Copy at Watson Memorial Library, Northwestern State University, Natchitoches. NOTE: This unpublished paper by Lee, an anthropologist who directs the region’s FolkLife Program, explores the slave system that introduced Caddo and Canneci bloodlines and culture into the Isle. Mills, Elizabeth Shown. “Family and Social Patterns of the Colonial Louisiana Frontier: A Quantitative Analysis, 1714–1803.” Senior Thesis, University of Alabama, 1981. 231 pp. Copy on file in Mills Collection, Cammie G. Henry Research Center, Northwestern State University, Natchitoches, Louisiana. NOTE: This examination of colonial life along Cane River is based upon a study of the origin, lives, and relationships of some 2,702 individuals, representing all known residents along Cane River prior to the Louisiana Purchase. Wells, Carolyn M. “Domestic Architecture of Colonial Natchitoches.” M. A. Thesis, Northwestern State University, 1973. 102 pp. NOTE: Wells, a former archivist at Northwestern State University, exhaustively combed all extant notarial documents (deeds, succession [probate] records, marriage contracts, etc.) for this study of early homes and their furnishings. Brasseaux, Carl A., Keith P. Fontenot, and Claude F. Oubre. Creoles of Color in the Bayou Country. Jackson: University Press of Mississippi, 1994. Available from www.upress.state.ms.us/. Desdunes, Rudolphe L. Our People and Our History: A Tribute to the Creole People of Color, in Memory of the Great Men They Have Given Us, and of the Good Works They Have Accomplished. Dorothea Olga McCants, ed. and trans. Baton Rouge: Louisiana State University Press, 1973. Available from www.lsu.edu/lsupress/. Dominguez, Virginia R. White by Definition: Social Classification in Creole Louisiana. New Brunswick, N.J.: Rutgers University Press, 1986. Available from http://Rutgerspress.rutgers.edu. Dormon, James H., ed. Creoles of Color of the Gulf South. Knoxville, University of Tennessee Press, 1996. Available from www.utpress.org. Hamel, Reginald. La Louisiana créole: littéraire, politique, et sociale, 1762–1900. Montreal: Libraire des Presses du l’Université de Montreal, 1977. Kein, Sybil, ed. Creole: The History and Legacy of Louisiana’s Free People of Color. Baton Rouge: Louisiana State University Press, 2000. Available from www.lsu.edu/lsupress/. Logsdon, Joseph and Hirsch, Arnold R., ed. Creole New Orleans: Race and Americanization. Baton Rouge: Louisiana State University Press, 1992. Available from www.lsu.edu/lsupress/. Schafer, Judith K. and Warren M. Billings, eds. "An Uncommon Experience: Law and Judicial Institutions in Louisiana, 1803–2003." The Louisiana Purchase Bicentennial series in Louisiana History, vol. 1. Lafayette, La. : Center for Louisiana Studies, 1997). Available from www.louisiana.edu/Academic/LiberalArts/CLS/series.html. NOTE: This volume richly treats the laws governing slavery and manumission in Louisiana. Despite its title, it includes the pre-1803 French and Spanish regimes.